We not only take Cigna dental insurance like the average dentist in the dental industry does. We are a Cigna preferred provider office that offers anxiety-free sedation services including twilight sedation and general anesthesia. You as the patient can choose a dentist from a list of dental providers that have contracts with Cigna dental insurance. When you choose a dentist, you receive benefits available under the cigna policy. As of 2018, plans with surgical implant coverage are available. Prior authorization may be required for certain specialty care treatments like dental implants. Only those procedures that are medically necessary and listed on the plan’s Patient Charge Schedule (PCS) are covered. Services related to the surgical placement of a dental implant are limited to one per year with replacement of a surgical implant frequency limitation of one every 10 years. Prosthesis over implant replacement is limited to every 5 years if unserviceable and cannot be repaired. The frequency limitations of certain other covered services are set forth in the PCS. Are white porcelain fillings covered by Cigna Dental? 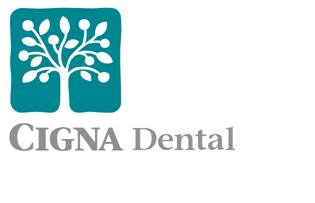 Cigna Dental’s plans cover white fillings. However, some Cigna plans may restrict this benefit depending on the location of the tooth. For more detailed information see Cigna plan booklet or contact our office. The "Tooth Missing But Not Replaced” rule applies to initial dentures, fixed and removable bridgework and implants that replace teeth missing, lost, or extracted before the effective date of coverage. Services subject to the "Tooth Missing But Not Replaced" rule may not be covered by your Cigna Dental plan. See Cigna Dental plan booklet or call our office for specifics. Cigna Dental PPO plans may cover comprehensive orthodontic -braces treatment of transitional, adolescent and adult teeth. See Cigna Dental plan booklet or call our office for details. These plans do cover replacement dentures and partials, subject to plan limitations or exclusions. See your Cigna plan document or contact us for details. Cigna cover partial and full dentures. In many clinical situations, you may be covered for extractions and immediate denture procedure. Services started before your Cigna Dental Insurance effective date. What will the Cigna Dental plan cover if a service started before my effective date? If you were not covered under a previous carrier and started treatment for a service, it may not be considered eligible under this plan if your plan has a work-in-progress exclusion. If more than one dental service is needed to fix a problem, most services would be considered separately. Although dental services started before the start date of coverage may be denied, any dental services started after the effective date would be considered for benefits. Cigna Dental Frequency limitations. Are there restrictions on how often a dental service can be performed? Please see your Cigna plan document or call our office for details. Predetermination. How will I know if the dental treatment I need will be covered by Cigna? The easiest way is to have your dentist send a pretreatment estimate (predetermination). This will let both you and the dentist know what the benefit would be if the service were done. Your dentist may also call customer service at the number on your ID card for general information about your dental coverage. Are wisdom teeth removal covered by Cigna? Wisdom teeth extraction and regular extraction. How will tooth extraction services be covered by my Cigna dental plan? Extractions maybe consider under your Cigna medical or Cigna dental plan. We would send Cigna a predetermination for wisdom teeth. For more information on simple and surgical extractions please call our office. Periodontal maintenance. When is periodontal maintenance covered by Cigna? This procedure is for patients who have previously been treated for periodontal disease. Cigna PPO plans require surgical and/or nonsurgical periodontal history. Orthodontic treatment including Invisalign and braces takeover and work-in-progress. Continuing or starting braces treatment – What do the patient need to know? If you are enrolled in active braces treatment or considering treatment, Cigna dental want you and your orthodontist to have a positive experience when you transition your braces treatment. Please include all of the following information with your first paper or electronic claims submission. This will help Cigna make a benefit determination quickly and should eliminate the need for additional claims submissions. Previous insurance provider information, including deductible, coinsurance/copay, maximum and amount paid to date (if the patient is continuing active treatment). This will help determine you're available orthodontic -braces benefit. Please note that you do not have to change your orthodontist if you began braces treatment before your Cigna effective date. For member eligibility questions, call the Cigna Customer Service number on the member’s ID card. Orthodontic braces take over and work in progress. What is this and how will it impact my braces benefits? Orthodontic work in progress for Braces an Invisalign: This is a situation in which an individual member who was not previously active with the plan sponsor begins coverage with Cigna plan. Example: Plan X sponsor has Cigna dental coverage effective 02/01/2015. A new X employee enrolls for dental coverage on 07/01/2017. If your Cigna plan includes the work-in-progress exclusion, braces treatment will not be eligible for coverage. Please see your plan document or contact our office for details. Insurance carrier takeover: This means a situation in which a plan sponsor previously had dental coverage through another carrier and provided coverage for the service. The plan sponsor terminates coverage with the previous carrier and begins coverage with Cigna. This only includes individuals who were covered under the prior plan at the time of the takeover. Example: Plan sponsor X has YNZ dental coverage effective 01/01/2018. The entire X Company terminates with XNZ dental on 12/31/2019 and begins coverage with Cigna dental on 01/01/2019. In orthodontic takeover situations, the treatment is only eligible for consideration under Cigna if the previous dental carrier covered and considered the member’s braces treatment plan. Get estimated average costs for cleanings, fillings, X-rays and more. See what’s covered by your Cigna plan. Check Cigna dental claims and statements. BOOK your Cigna dental appointment ONLINE! Manage your Cigna Insurance plans access dental health resources. PPO Dental provides the freedom to visit any licensed dentist or save more by visiting one of over 50,000 Cigna Preferred Dentist Program dentist locations nationwide. Did you know you can purchase Cigna dental insurance even if you do not have medical insurance with Cigna? Cigna Dental center offers a variety of dental preferred provider organization plans to people who want their own separate Cigna dental insurance. If you are already enrolled in a Cigna Individual or Family medical plan, you can easily add dental coverage and manage all of your oral health care needs in one place. Cigna insurance offers a wide range of covered dental services, a large national network of dentists and 24/7 customer support.